"The first thing I do in the morning outside of pouring a cup of coffee is pick up my guitar and either begin a new song or work on something that has been brewing (outside of the coffee, that is). My deepest desire is to inspire and move people to feel something, to laugh, cry or consider new ways of thinking. Nothing is more satisfying then to know something I have written has made even the smallest positive difference in a persons life." 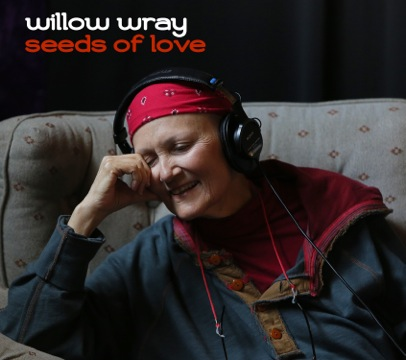 Willow Wray has been a professional vocalist, writer and performer for over 25 years. She has performed with highly acclaimed musical productions and gained national notability for her numerous award winning performances as a lead singer with the trio Nicholas, Glover & Wray. From the late 60's, she was performing in rock bands and coffee houses. 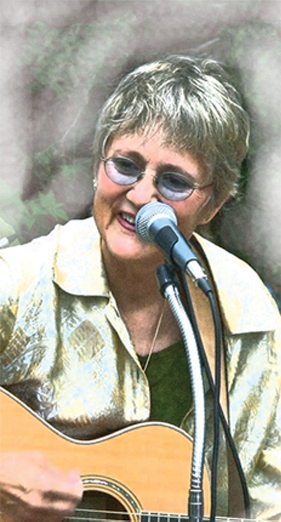 In 1972, she joined the rock group Joy of Cooking performing backup and support vocals with Terry Garthwaite for six years and has been a supporting vocalist on albums for every major record label. In the late 70's, she teamed up with Julie Nicholas and Sheilah Glover and created Nicholas, Glover & Wray. 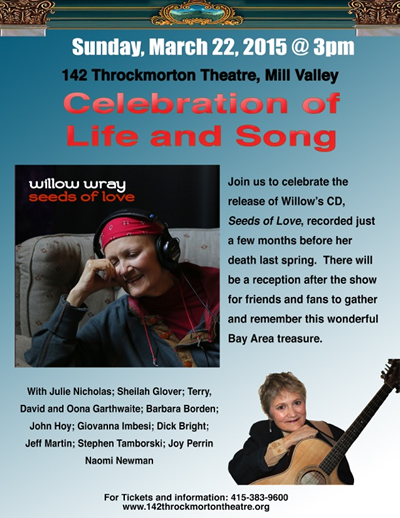 Willow's voice has been heard on hundreds of regional and national radio and television commercials for companies such as Hershey's, Levi Strauss & Co., Pacific Bell, Hewlett Packard, Citicorp, MicroSoft and Blue Cross not only as an outstanding voice talent, but also for her ability to mimic many popular vocalists and motion picture personalities. Willow's family background is rich in theatrical and movie history. Her grandmother and namesake Willow Wray was known as the "Waltz Girl of Radio" in the 1930's while her great aunt Fay Wray achieved legendary status for her role as King Kong's fatal attraction. Her background includes stage, motion pictures, animation, industrial, trade-show, radio and television performances.